Ten people held more than 100 acres of land. A complete list of occupiers with the total area held in 1841 is here. Richard Brewster, farmer with 118 acres, lived at The Holmes (Holme Farm). Robert Harris, farmer with 55 acres, worked Brocker Farm. George Harrison Jnr., farmer had 31 acres, on Grantham Road. John Horsepool Jnr., farmer with 76 acres. He still had a detached field over at Brocker. Not in census. His house is now the derelict Fosse Farm building (Moot Hill Farm on some later maps). Bull Moor, Fell Dyke, Meadow Moor and Far Little Moor were divided into 22 new enclosures. High Starnhills and Far Starnhills were divided into 5 enclosures. Three or four smallish fields in what is now Spring Farm were further divided. Four or five fields on Brackendale were similarly divided. This map shows how some holdings were already concentrated into groups of fields but that many holdings were still scattered about the parish, particularly on the more productive southern lands. Their farmhouses were still in the town – Beauvale, Banks House, Newgate Street etc. John Foster (Banks House) had two groups of fields; three in pasture in the north of the parish and a mixture of arable and meadow on the southern slopes. William Pacey had a block of arable near the south west corner, a meadow on Nottingham Road, some pasture in the north and Crow Close, of which he owned the freehold. Lee, Skinner, and the others similarly held three or four groups of fields. This map shows the smaller farmers’ holdings (25-50 acres). Even with smaller holdings, the fields were often scattered; Henry Crook (also keeper of the Blue Bell Inn) and James Horsepool had the most scattered holdings. William Bower’s main holdings were in Whatton. The remaining smaller land holders (under 25 acres) are shown on this map. John Pilgrim ran the Royal Oak – later the Chesterfield Arms – and his only holding was at this far flung end of the parish. One can only wonder why he bothered! William Walker was a seedsman and one wonders if he grew his seeds on his five fields. Comparison of size of holdings since 1586 (figure 3) provides an interesting commentary on social change over the period resulting from the two processes of enclosure and urbanisation. The absolute numbers of holdings over 25 acres changed little (28 in 1586 and 1776, 26 in 1841). This is no great surprise; the point it emphasises is that the expanding population was crammed into an unchanging and relatively small area of land, resulting in the slums of the nineteenth century. Farming practices may have changed – the ratio of arable to grazing, mechanisation leading to reduction in the labour force etc, but the amount of land in production and the division of that land continued unchanged for over 300 years. Although the number of holdings over 50 acres did not change, the number over 100 acres increased after enclosure by the same amount as the decrease in number of holdings between 50 and 100 acres. This suggests that demesne land, after enclosure no longer farmed directly for the estate owner, was generally redistributed amongst existing larger land holders. 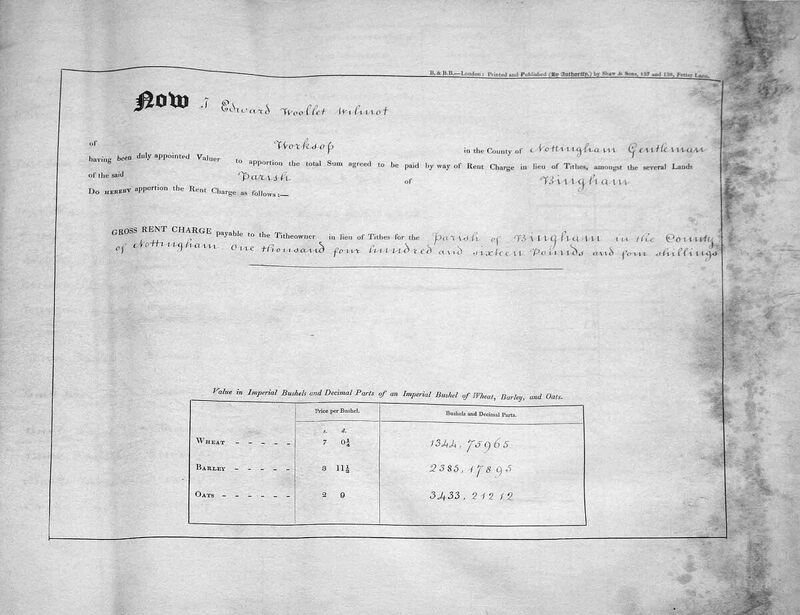 By 1841 over half the land in the parish was farmed by just ten families. approximate distribution of land use in 1841. Lowe’s survey in 1798 of the Vale of Belvoir suggests that a farmer might change from arable to pasture every six or seven years. This may have happened to the north west of Bingham which had a history of meadowland and moorland. The old moorlands might not have been suitable for such rotation. It may not have happened so much to the south on the better drained lighter soils. Our interpretation of the pattern of cultivation is reinforced by the summary at the beginning of the apportionment document which shows 2100 acres (around 70%) as arable and 823 (30%) acres as meadow or pasture – 234 acres more arable than we estimated. (7s * 10%) + (4s *15%) + (2s 9d * 20%) per £100 of the old tithe. The table presumably acts as a ready reckoner to allow the final step to be omitted by merely multiplying the new prices per bushel by the calculated ‘bushels and decimal parts’ to reach a new total valuation. The new tithes for each property would presumably then be calculated in proportion whenever prices had been deemed to have risen sufficiently. The table is not an indication of crops grown or yields achieved. The raw figures in the table work out at about 3.4 bushels per acre. One web site (www.hartley-kent.org.uk/history/farming.htm) quotes 22 bushels per acre for wheat, 32 for oats and 28 for barley for Hartley in Kent for 1844. If a tithe was one tenth of the production this would allow Bingham yield to be about 34 bushels per acre and Barcombe about 32. Could it be that this sort of relationship underpins the choice of index, on the basis of nationally expected yields? The presence of three windmills in the parish rather confirms this concentration on crop growing.